Laminate flooring is a popular go-to when it comes to kitchen design, thanks to the fact that it’s affordable and relatively low maintenance. That said, although it’s much easier to take care of than alternatives like hardwood or fancy tile, it also tends to show every speck and streak of dirt if left unattended. Proper cleaning technique is more important than ever when it comes to laminate, which is why we’ve compiled this handy list of tips on keeping your floor sparkly and clean! As surprising as it might seem, using a broom on your laminate floor is a bad idea. A traditional broom will always leave dirt and crumbs behind, and can even result in permanent scratches. Don’t get too excited though. This isn’t an excuse for you to stop sweeping entirely; it just means you need to use a more appropriate tool—like a dry dust mop, for instance. The static pull will pick up every last speck without damaging your laminate.You can also vacuum floors with bristle floor attachment, it’s the best option to pick up all dust and debris. Yes, it’s the easiest way to move those stubborn streaks and stains, but if you use too much water in your cleaning process, it will seep under seams causing swelling and other irreversible damage. Try to limit your use of water and cleaning liquids as much as possible. This is a definite case of “a little goes a long way”! It’s tempting to go out and buy every new cleaner to hit the commercial airwaves, but in reality, there are few things more efficient than homemade cleaner! In fact, all the chemicals and byproducts in most leading brand all-purpose cleaners will actually leave your floor streaked and dull as opposed to shiny and new. A basic mixture of water with a bit of vinegar is typically enough to budge even the toughest of streaks. Add a bit of rubbing alcohol for those tough spots, and some mild dish soap for that “just cleaned” smell. Now that your floor is clean, give it a gentle buffing to get to mimic the sparkling effect seen so often on television. No special chemicals required, just rub a cloth or microfiber mop a few times over the surface and you’ll get that coveted shine in no time! Once your floor is looking shiny and new, the next step is keeping it that way. 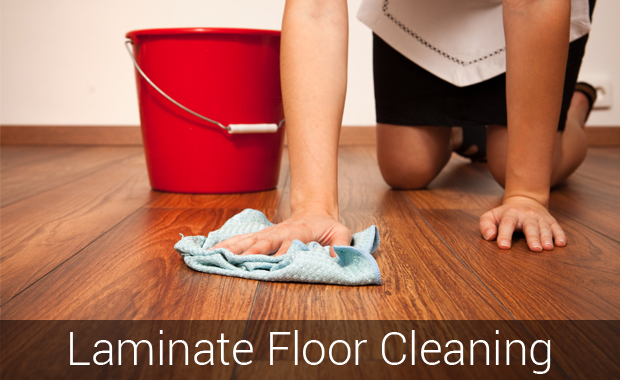 Take preventative measures like removing your shoes as soon as you enter the house and wiping up spills as soon as they happen, and your laminate floor will never look dirty!